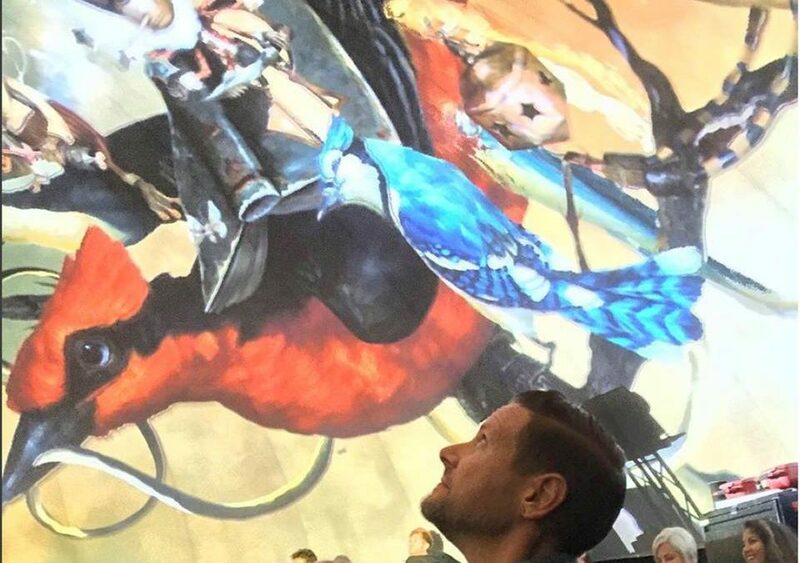 (Press Pass LA, 17 November 2015) – Press Pass LA had the chance to attend an exclusive media preview of Likuid Art in the Vortex Dome in downtown Los Angeles to experience the technology that had everyone buzzing at the Pepsi Dome at Voodoo Festival in New Orleans. We were BLOWN AWAY by the technology and there is no doubt in our minds this will change the future of art! We HAD to score an interview with Likuid Art founder David Booth Gardner to talk about how this technology came to be and their plans for what’s next. PPLA: What inspired you to start Likuid Art? How did this idea first come to fruition? DBG: Eight years ago, a friend of mine, the artist Andrew Potwora, brought to my house a DVD of a ten-second digital art piece inspired by a painting of Hollywood and Highland. We played music and watched it loop over and over – and it was mesmerizing on a large flat screen TV. The idea of finding a way to distribute digital art struck me immediately, and I asked Andrew if he knew of any other artists using digital tools; he introduced me to the artist Bill Barminski, who works with traditional mediums – paint, cardboard – and is also a masterful digital artist. I developed the idea for about a year, but the technology wasn’t there to easily distribute the content – streaming wasn’t ubiquitous, Netflix was still a DVD shipping company… but I also knew that others out there had the same idea. Sure enough, in a few years I became aware of Framed and Sedition Art – two digital art distribution platforms. I went back to the idea, came up with the name Likuid Art, and began networking with artists – including Andy Warhol photographer Karen Bystedt, who introduced me to fellow artists and creators. Bill Barminski did a piece based on one of Karen’s Warhol photos, and we did another called Warhol Cubed. I began working with others to help build the company – VP of Artist Acquisition Chris Kane, who comes from the gallery world, and Creative Director and Artist Chris Saunders, who comes from design – and immediately we found our niche: transforming traditional works, paintings and photographs, into kinetic artworks by collaborating with the top After Effects and Cinema 4D animators in the world. PPLA: Your background is in producing and directing network TV- over 200 hours for major programs, impressive!! You also ran an environmental focused news and social network. How did those experiences help you in starting Likuid Art? What inspired the career change? DBG: I’ve had some varied jobs. After obtaining an MFA at UCLA, I worked for Warren Beatty’s production company, then started a theater company that produced a play based on the writings of Charles Bukowski. I even worked at the LA Zoo, helping to take care of the chimpanzees. From there, I segued into publicity – one of my first clients was Lance Armstrong during the first two years of his Tour de France victories (which have since been rescinded). Then I got into television – History Channel documentaries, reality, entertainment news, on and on…. All of these experiences taught me one thing – it’s never too late to reinvent yourself. And if you believe you are capable of accomplishing something, even if you have no experience doing it, just go for it… and stay strong in the face of failure, which has to be your friend as much as your enemy. Failure is what gives you grit, the most important ingredient to being an entrepreneur – more than vision, creativity, management skills… it’s grit. I was always restless working in television – it never felt like an endgame for me. I had always been passionate about the environment, and decided to launch Planet Experts, a news and blog platform that shines light on the environmental activists, scientists and organizations making a difference in how we relate to our planet. Since our launch over a year and a half ago, Planet Experts has published over 3,000 articles, and now features over 150 of the world’s top scientists and environmental NGOs. We’re small, but our staff is passionate and smart…. and we’re just getting started. It’s the same with Likuid Art. I launched it with no relationships in the art world to speak of – but I love art, expression and creativity. And I knew it was an idea with potential. I just went for it… years went by without any traction, but eventually I began meeting the right people, and now we’re launched. PPLA: The technology for Likuid Art is very innovative. How did it come about? How do you see digital art changing the art industry and the way we experience art in years to come? DBG: Digital art definitely has the potential to change how we experience art. It will allow us to see art in new ways. No longer do you have to imagine how a painting might move, or behave if it could come to life – you can watch it happen. But digital art will never replace the traditional art market, in the way that Netflix wiped out Blockbuster. I, for one, love paintings, sculpture – all kinds of art – and will always want to experience and collect it. Digital art is an expansion of what already exists. It’s an additive – but potentially a transforming one. And the best thing about it is, with Likuid Art – for a nominal fee of $6.99 – $16.99 a month – you can gain access to some of the finest artists in the world, whose canvases sell for tens of thousands of dollars. Likuid Art provides the masses more exposure to art, and might even inspire some young kid to create art who, without a Likuid Art subscription, would not have otherwise encountered Craola or Risk. We want our subscribers to learn about both the artists and the animators, and – for each piece of artwork – we link back to their web pages and promote our artists’ social media handles. Our animators deserve a lot of credit for the final piece. This is truly a collaborative process. As much as Likuid Art is a platform for streaming digital art, it’s also an opportunity to discover the world of art and animation. PPLA: How do you pick the artists? Are there certain art pieces that won’t work with Likuid Art? Are there characteristics that make a piece more ideal to convert to digital? DBG: Our team has relationships with some of the top artists in Los Angeles, which is a thriving art scene; on any given weekend, there are five or six shows worth going to. Certain pieces lend themselves to animation – they inherently possess movement. If either our Creative Director Chris Saunders or I see a piece and can imagine how it should move, we’re immediately interested in working with that artist. There are two types of animation styles that we use. Some pieces are very active, featuring more rapid movement and requiring active watching, whereas others are more contemplative, and shift with subtlety. Both styles have their time and place. PPLA: What type of events can Likuid Art be used at? Anything from a rooftop cocktail party to a stadium experience? DBG: We can easily display Likuid Art at rooftop parties; in fact, we recently did a really cool event at the Standard Hotel in downtown Los Angeles, where we projected a loop of Likuid Art above the hotel bar. It added a surreal, unique quality to the event. But we really pushed the boundaries with our Pepsi Art Dome experience that we produced for Voodoo Fest in New Orleans. It took what we do to a whole other level. PPLA: Do you think Likuid Art can become the Netflix or Spotify of the art world? What went into deciding your subscription packages? DBG: That’s the goal, and we’re certainly not the only ones with the idea of becoming the Netflix for digital art. But it’s early in the game, and no one has emerged as the dominant player yet. I think digital art has some time before it catches on – at first we’ll appeal to early adopters who like new technologies and new discoveries. But, as digital art screens become more prevalent in homes, people will need content for them. Homes of the future, I think, will have screens built into walls for all kinds of purposes – art being one of them. We decided to go with subscriptions vs. downloads (Spotify vs. iTunes) because of the way digital media is consumed these days – people are used to renting, not owning. And we’re not trying to create an aftermarket for our digital art. I’m more than happy for a million people around the globe to be able to stream the same piece of art as opposed to offer a limited series that ups the price…we want our price point to be low. For just $6.99, you can change out four new pieces every month in your collection and discover some seriously cool artists. PPLA: Instead of on a TV or iPad… do you think Likuid Art might eventually sell digital screens of its own, like big paintings where the art can stream to and change. So it can be above your couch or wherever you like? DBG: We are currently not in the hardware business – though many of our competitors are. And while we may someday have a screen partner, our focus now is developing great content. PPLA: What’s the first piece of art that inspired you and how old were you? DBG: My mother worked in western art museums when I was growing up in upstate New York, and I remember seeing a lot of Remington Bronzes. My parents still have a vast collection of Western Art. But, without a doubt, the first painting that moved me, struck me to my core, was Vincent van Gogh’s The Starry Night at the Museum of Modern Art in New York. It’s the “Stairway to Heaven” of paintings – it’s everywhere, so much so that you maybe take for granted how good it is. In person, it’s an entirely different experience. Van Gogh infuses his work with so much emotion, and his color choices were completely revolutionary – so much so that his work was refused. I bought into all of that hook, line and sinker – a troubled artist, way ahead of his time, who dies before his genius is recognized. It’s a tragic story… I read The Letters of Vincent van Gogh just to get inside his head. Seeing any Van Gogh in person still shakes me to my core. I’ll be in Paris soon, and I’ll definitely be visiting the Musee d’Orsay to see its collection of Impressionists.